Unless you have been detached from the internet as a whole over the last few days, you likely have seen the absurdly rapid growth of Pokémon GO over the past few days. I have to admit, it took a few days before I even considered installing the app. I’ve never been a huge fan of Pokémon, and I’ve never played any of the games over the brand’s 20-year lifespan. I did play Ingress a ton for a couple years when it was new, and I knew Pokémon GO is made by the same great folks at Niantic. So, I installed the game in hopes that it would be something my daughter would enjoy and that we could maybe play together. That was definitely a win. Just last night, our family (Me, wife and both kids) joined numerous others in our small downtown playing the game. And I have to admit, it was a lot of fun. I couldn’t help but remark multiple times to my wife that the game exhibits many similarities to Ingress. Again, this isn’t strange as Niantic created both games, but I was simply flabbergasted at the volume of people out playing an AR (augmented reality) game. In my hometown, I could have only dreamed of this many people playing Ingress at once! Granted, people reading this article are statistically unlikely to even know what Ingress is at all. And, that’s kinda the point of this artilce, so here it is a little history. Ingress began 3 years ago as a small project under Google’s wing. They created an augmented reality game that took off probably quicker than anyone really expected. In small towns like the one I live in, it took much more time for the game to catch on. But, the premise was/is relatively simple. The game has spots planted on a real map that you have to visit in real life to interact with. Claiming these ‘portals’ then gives you the ability to create links between those portals and other portals you have keys to, creating triangles between them called fields. Between leveling up, breaking down the opponents links and fields, and building your own fields, Ingress is wildly addictive. In the early stages I was hooked. I loved every element of its game play and I played a lot. Part of the game play was finding unique structures, works of art, statues, or places of worship to submit as portals. It became a hobby of mine on a daily basis. And our small town went from having 13 portals too well over 150 Portals the last time I checked. Here lately, I don’t play very often. Back when I did, my only child (at the time) was much younger, and I didn’t have a second child. Life’s a lot busier now, hence the lack of play. 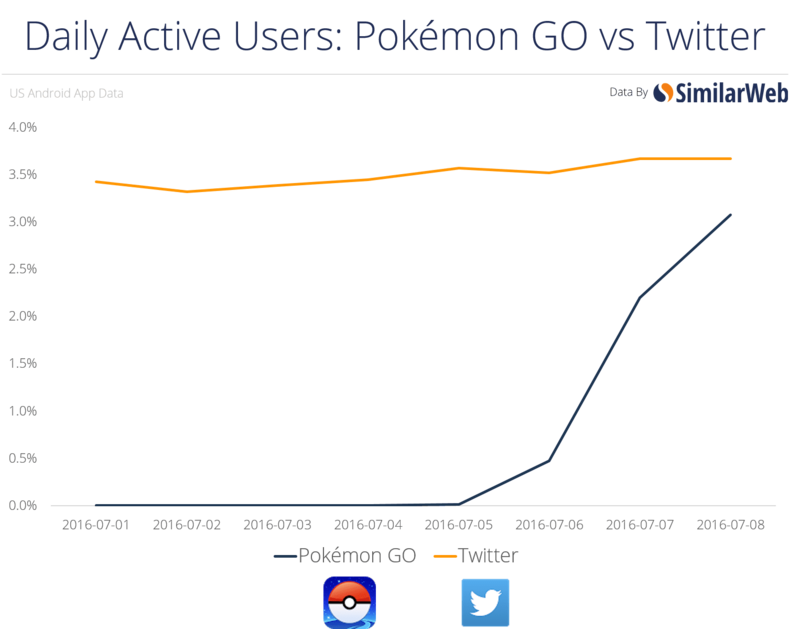 In just a matter of a few days, Pokémon GO has managed to gain almost as many users as Twitter on Android devices. Twitter. In a few days. As my wife, daughter, son and I walked around downtown last night, I was blown away at the number of people playing this game that is only days old. Not because it’s odd for a game to become popular quickly. No, I was blown away because it is odd for an AR game to become this popular this quickly. Most intriguing, though, was the fact that the game play is so similar to Ingress. I remember so many times that I wished there will be large groups playing Ingress around my hometown. The most I ever saw at one point in time was five or six people together. It was difficult to get other people to understand the game, it was hard to get my wife to understand why I wanted to play it, and for some reason it was just tough to get people together in general. Yet, there I stood watching at least 50 people mill around a small downtown area trying to catch Pokémon. Nevermind the fact that the majority of ‘Pokestops’ are portals that I submitted while playing Ingress. Nevermind that hours upon hours of Ingress gamers’ time and play helped build this phenomenon. No one around this town will ever know that. No one will know that other people playing Ingress before them helped pave the way. And that doesn’t really matter that much. Here’s what does matter. For the initiated, Ingress is a great game. The formula they have in place works. The game play, the concept, the community around the game…it all works. And yet, though all those things are in place and have been for over 3 years, the user base for Ingress will never see that kind of growth that the one for Pokémon GO will enjoy. The reason? I believe it has everything to do with the injection of a stable,recognizable, beloved brand. Pokémon has a built-in following and a popular format. Games don’t stick around for 20 years unless they have those things. So now you take the formula Ingress employs and inject an insanely-popular, broadly accepted brand and you get Pokémon GO. So, why are we talking about this here at Chrome Unboxed? The answer is simple. If you look at what happened between Ingress and Pokémon GO, I believe the same results are getting ready to happen with Chrome OS and Android. We’ve spoken about this at length on this website, so I won’t go into it more here. If this is the first you are hearing about Android apps coming to Chrome OS, feel free to click this link and read more about it. What I do want to add to this conversation in this particular post is a bit of perspective. Between the website and YouTube channel, we see a lot of comments and discussions. Some of that discussion still seems to hover around Chrome OS failing in the end. And, while there are many people who are excited about the Play Store coming to Chrome OS, they are still not sure how it will play out. Now, I’m no fortune teller. I do, however, see trends. And what I see with the Play Store coming to Android mirrors exactly the story of Ingress and Pokémon GO. I see in Chrome OS a formula that is working, stable, brilliant, usable, and worth people’s attention. I clearly love Chrome OS. I want to see it succeed and I want to see other people using it. However, though I’ve helped friends and family make the switch to Chrome OS and heard of others who do the same, I still must concede that there is still huge potential for growth in the laptop and PC market for Chrome OS. There are still so many people that don’t even know what Chrome OS is. Or what a Chromebook is. There are so many people that may never change their usage habits so that they might enjoy using Chrome OS. And, to me, that feels exactly like my Ingress story. Great formula, great experience, but few are buying in. However, Chrome OS fans, our Pokémon is only a few months away. We should not underestimate the impact that the Play Store and Android apps will have on the Chrome OS Community as a whole. I’ve said it before, and I’ll say it again: more apps means more developers, more devices, more OEMs, and more consumer interest in Chrome OS. The growth will not be small. It may not be instant, but it will not be small. As the familiarity, recognition, and broad reach of Android becomes injected into Chrome OS, I believe the sky is the limit. I believe this operating system could move into segments of the market we’ve never even considered at this point. I believe the future of Chrome OS is brighter than it’s ever been. And I can’t wait to watch it unfold!